The lowest-tier tickets to the hyper-scale cloud club cost $1 billion per quarter. Companies that can’t afford to spend at least that much every three months on data center infrastructure should be concerned about their future. That’s according to John Dinsdale, chief analyst and director at the market research firm Synergy Research Group. Competing successfully with the top cloud providers, each of whom has been spending at least that much on infrastructure, calls for a level of investment that’s on par, he said. In a recent report, Synergy tallied up fourth-quarter 2017 capital spending by the world’s largest cloud, SaaS, social network, and other tech companies of significant scale, finding that together they spent $22 billion during that period, most of it on data center infrastructure. Over the last four years we have seen many companies try and fail to compete with the leading cloud providers. The capex analysis emphasizes the biggest reason why those cloud providers are so difficult to challenge. Can you afford to pump at least a billion dollars a quarter into your data center capex budget? If you can’t, then your ability to meaningfully compete with the market leaders is severely limited. Of course factors other than capex are at play, but the basic financial table stakes are enormous. And spending by the cloud giants continues to grow from year to year. The group of companies Synergy looked at collectively spent $75 billion in capex in 2017 – up 19 percent from the prior year. The top five spenders in the group in Q4 were Alphabet’s Google, Microsoft, Amazon, Apple, and Facebook. They were responsible for more than 70 percent of the group’s total spending. Other major spenders were Alibaba, IBM, Oracle, SAP, and Tencent. 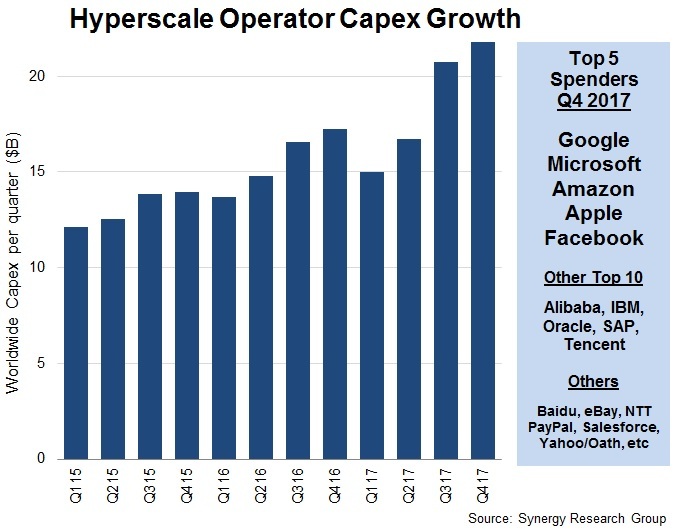 Spenders outside the top 10 included Baidu, eBay, NTT, PayPal, Salesfoce, and Oath, the Verizon brand that owns Yahoo assets. Nearly all these companies both lease data center facilities and build their own to expand. Levels of infrastructure spending by these giants have caused dramatic shifts in the data center provider industry, companies that build and lease data centers to tenants. All top data center providers have adjusted their business models and investment priorities to serve the hyper-scale sector. The most recent company to implement big changes to position itself to better cater to this market was QTS, which last week announced a major restructuring that will see it eliminate its own cloud and managed hosting services and focus on wholesale leasing to hyper-scalers and enablement of hybrid cloud for enterprise clients. The announcement took analysts and investors by surprise, resulting in a steep drop in QTS shares. The move even caused one activist investor to publicly call on QTS to consider selling its assets and replace its top management, because they allegedly didn’t make the changes fast enough. Rushing to improve its standing in the market, QTS announced Friday a massive, 24MW lease with a major SaaS company, whose name it did not disclose. QTS will build a data center for the client in Manassas, Virginia, where it closed on a purchase of 61 acres of undeveloped land. QTS said it will build a 24MW powered shell on the new site for the customer and initially build out a 5MW turnkey data center inside. Expanding the customer’s capacity in the shell one step at a time will ensure QTS can meet the customer’s needs while following “a disciplined capital plan.” The site has the potential to support a gross 85MW of power, the data center builder said. Manassas is in Northern Virginia, where much of the data center construction for hyper-scale cloud platforms has been happening. Amazon continues expanding its footprint in the region; Facebook, Google are building there, in addition to leasing from the wholesale providers in the area. Synergy has identified 24 hyper-scale companies. It estimated that there were about 400 hyper-scale data centers around the world as of the end of last year; that number would rise to 500 by 2020, the analysts said.